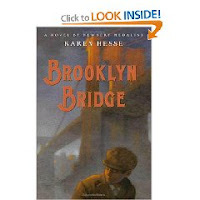 Brooklyn Bridge by Karen Hesse is a fascinating book. It is actually comprised of three different threads that are woven together. The first thread is what I will call the "main" storyline, and is written in typical, chapter format. The second thread is about "outcast" children who live under the Brooklyn Bridge. The final thread is many news articles (they appear to be the real thing) written about the opening of Coney Island. The first storyline is historical fiction, and revolves around the family (Michtom) who made the first teddy bear. I loved getting to know all the characters in the Michtom family (especially Joseph, who is 14 years old), the family's extended relatives, and the people who live in their neighborhood. Hesse does a lovely job with character development, and allowing us to feel the tensions that come about as an immigrant family tries to better their lot in life. Joseph's adolescent rebelling against never having time to do fun things like go visit Coney Island is very realistic, and many children reading this book will relate to it . I also enjoyed reading the articles from different newspapers that talked about all the wonders of Coney Island -- it was the equivalent of Disneyland back then! The part I didn't enjoy as much was reading about the children who lived under the bridge. Not because their reasons for being there were tragic (and they were! ), but because I was having great difficulty conceptualizing one of the characters - Radiant Boy, and his interactions with the other children. In this section, Hesse does an excellent job of helping the reader understand the desperation these children felt in the lives they lived before they lived under the bridge. It takes great skill to take 3 threads of a story , and weave them together, but Karen Hesse did just that. The language in this book is beautiful. I can understand why Brooklyn Bridge made several mock Newbery lists. I'll be interested to see what the Newbery panel decides. I'm a huge fan of the book Fever: 1793 and recommend it to any student that loves historical fiction. It has to be one of my all time favorite novels for upper grades. 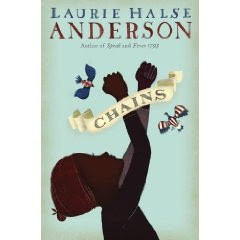 When I saw that Laurie Halse Anderson had another historical fiction novel getting all sorts of attention I had to read it. Chains is about Isabel, a slave girl in Rhode Island who, instead of getting freedom upon her owner's death, she gets sold to a ruthless couple from New York. The mistress of the house has some serious anger issues and believes in strong discipline for her slaves and to make matters worse, Isabel's handicapped sister is sent away. Isabel meets up with a freed slave that fights for the American cause and he encourages her to spy on her new master who is identified as one of the leading Loyalists in New York. Laurie Halse Anderson does an interesting job of taking the reader back and forth between what Isabel should do. She is torn between working for the American sympathizers for freedom or working for the British supporters for freedom. Both sides of the dilemma are presented in a believable way and I found myself changing my mind about what would happen at every turn. I wasn't sure about this one as I was reading it, I thought it moved a little slow, but in looking back I realize now that the author does such a great job of developing a plot with so many twists and turns that it couldn't move any faster and be this good. Before you start, be warned it's just the first novel in the saga of Isabel. I wasn't aware of this when I started so I must admit I was a bit disappointed when the story didn't finish. Interestingly, I saw a couple of reviews from middle school students who really enjoyed the book. So obviously there are kids out there who will enjoy this book. In my opinion it is for more of a middle school audience, so I'll continue to put Fever: 1793 in my students' hands. Chains got 7 mentions according to the list at Fuse #8 the most of any title. Perhaps for all of these reasons, I avoided reviewing this book because...ok...I'll say it...I didn't like it. There, it's out and I feel better for it! I agree that Kathi Appelt uses beautiful language that reads almost like poetry. I agree that she successfully weaves several story lines into one major story line. The story is tragic, beautiful, and extremely sad, so much so, that I'm not sure a lot of KID readers are going to get it. As I read books, I am constantly thinking of which KIDS will like them and how will I present them so KIDS will be interested. I couldn't come up with a way that would make this book appealing to KIDS, so I wasn't fond of it. Interesting to me as I sat down to write this and began looking at what others have said about it, I was struck by a couple of things. I think the cover of The Underneath is a bit decieving. Yes, it hints at sadness in the animals' eyes, but to me it still gives the impression of a more gentle tale than it really is. The other was that, when I viewed the trailer for the book, it doesn't really hint at the level of sadness and pain within the book. In the end, do I think this book will win a Newbery of some sort? Yes. Does it deserve to? Probably, based on the writing alone, yes. Will it be a KID friendly winner? I don't think so. I'm still looking for Newbery, but I'll be a little sidetracked today because my entire side of the family is coming for our Christmas celebration together. I'll be doing a lot of cooking and cleaning and baking in preparation. So, because my time is a little short, I am going to re-look at a book I reviewed this summer. Hate That Cat, by Sharon Creech was the companion book to Love That Dog. As compiled by Fuse #8, it was mentioned on at least three mock Newbery lists. I loved it, and am going to refer you to my review of this book back in July. You will actually get a bonus here, because I have a link to Mary Lee's (A Year of Reading) review also. If Hate That Cat would win a Newbery award, my students would be so excited!! We have done a 3 week study of Love that Dog and Hate That Cat -- they have been enthralled by it!! It is amazing how Creech can say so much with so few words! 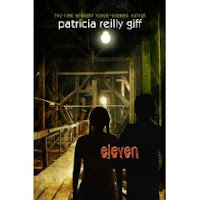 Eleven, by Patricia Reilly Giff, is the second book I read on my "looking for Newbery" quest. Fuse #8 tallied that Eleven has been mentioned on at least 3 mock Newbery lists as a possible Newbery winner. That was certainly a book worth my time! I loved Eleven! I loved the positive friendship between the two main characters, a boy and girl. I loved how there was a mysterious element to this book, which is accentuated with flashbacks. I loved how Sam, the main boy character, has an inability to read until he finds a reason important enough for him to learn. I love how his special education teacher is so supportive of him. I love Sam's grandfather, Mack, and his extended "family", Anima and Onja. I love the multicultural elements they bring to the story and to Sam's life. I love how eclectic Caroline (the main girl character) is. I love Sam's ability to make beautiful items out of all types of wood. I love how, because of his gift with wood, Sam will be able to give his teacher something in return for helping him learn to read. I love how Giff has an "Eleven" prologue, and an "Eleven" epilogue -- it really brings this story full-circle. I love the importance of Sam's dreams, interspersed throughout the story -- they have such great meaning. I love how eleven symbolizes so much in Sam's past, present, and future. I loved Eleven -- it is a book worthy of its 3 mock Newbery mentions!!! Well, today is the first day of about 30 days that Bill and I will be "looking for Newbery". One of the books that made Fuse #8's tally roundup of books mentioned for a possible Newbery or Caldecott was Trouble by Gary D. Schmidt -- it was mentioned in at least 2 places for a mock Newbery Award. I had read this book way back in the winter as an ARC, so this was a reread for me. I was amazed by Schmidt's use of language, and the way he so intricately intertwines his characters' lives. The words that kept coming back again and again in the story, and just couldn't be overlooked were: "trouble", "fine", "indeterminate", and eventually, the best word of all -- "GRACE". Each of these words had multi-layered meaning within the story. Schmidt's descriptions of the sea and the mountain, Katahdin, are realistic, as well as breathtaking. The way he feeds us different plot lines until they come together to form a whole is masterful. The main character (Henry), and supporting characters, are all well-developed. For a book that is mostly a drama/adventure, I really enjoyed the levity that Black Dog and Henry's best friend, Sanborn, brought to the story. The only thing I wondered during my reread is if this book was appropriate for my 5th graders. It would be a great book to put into a middle schooler's hands; they have a little more sophisticated thinking for some of the subject matter. Just a wonder on my part; not a criticism. Regardless of its target audience, it was a great read for me! I found myself as spellbound reading Trouble the second time as I was the first -- a true sign of a great book. I can see why Trouble made two of the mock Newbery Award lists. I'm just surprised it wasn't mentioned on more lists. OK, so my partner Karen has this great idea, and ropes me into contributing too, and now I can hardly wait to get started. As I was thinking of which books I wanted to review, I perused the list at Fuse #8 and realized I have read and reviewed quite a few of the top titles. Some I have read but not reviewed, and others I started to read but didn't finish either because I didn't feel they were appropriate for our elementary library, or I just didn't like them. I'm going to brag a little here, and say that last summer I posted an early Newbery list and the three titles I listed, Waiting for Normal, Greetings From Nowhere and Shooting the Moon all made the BIG list. We Are the Ship is also on the list, I just wasn't sure where to put it. So I feel like I really have a head start on the Newbery selection this year. I must admit that I am a bit disappointed that some of my favorites didn't make the list for example, Itch: a novel, and others like Jessie's Mountain didn't get as much attention as I think they deserve. Oh well, that's the nature of the game and who knows, maybe one of them will pull an upset in the end. In any event, I like Karen's idea and plan to have some fun with this. I know I speak for Karen when I say we hope you enjoy it too, and PLEASE, leave a comment to tell us what you think. This Friday, December 26, marks the one-month countdown to the announcement of the Newbery Awards January 26, 2009, at 9:45 EST. With that in mind, Bill and I will be looking for Newbery in the next month. Fuse #8 compiled a fabulous list of many Mock Newbery lists, and then compiled one list (scroll all the way down) with every title that had been mentioned somewhere, and the number of times each title was mentioned. For someone like me, who is way behind in her reading, it was the perfect holiday gift! So, I got online and immediately started to reserve these books from the public library, in hopes that I will actually have read the Newbery award winner, or at least the honors books, by the time the announcement is made! Even if my quest is not successful, and I don't read the actual Newbery Award winner, I will have a lot of fun in the process, and have read some fabulous books! However, that brought up a possible theme for Bill and me for the next month -- "Looking for Newbery". From Dec. 26 until Jan. 25, we will be reading and posting regularly about the books that were on Fuse #8's compilation. We will give brief reviews and include our thinking about the books. We hope you stop by and join us as we go "looking for Newbery"! 1) Yesterday was my last day with students for 2 weeks. I love this class, and will miss them a bit over break, but I am truly looking forward to 2 whole weeks devoted to my family, my friends, and me (and this part includes a lot of reading and blogging!!). 2) When I got home tonight, I spent some time talking to my daughter who is home from college, and then after she went out for the evening, I spent the rest of my evening writing my Christmas cards, and I got them all done!! I think tonight was the first day in a string of days to come that will be devoted to getting prepared for Christmas, as I relax in my own home. Saturday and Sunday will be for cleaning the basement and baking. I love working at my own pace. I am so fortunate to have these days off! 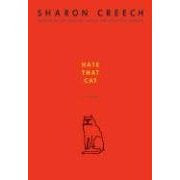 3) The last 2 weeks in school, I introduced my students to Sharon Creech's Love that Dog, and then the latest book, Hate That Cat. Most of them had never heard, or read, a book in verse before, and they are truly enjoying it. It's been great to compare the two books that have the same main character, and to see what carries over from the first book into the second book. I personally just love the teacher in the book, Miss Stretchberry. She is truly interested in expanding Jack's writing abilities -- I'm very impressed with how well she stays current with his writer's notebook. She's a good role model for me! 4) I am currently reading two writing books that are making a huge difference in how I see writing in my class's workshop -- Writing to Persuade by Karen Caine and Assessing Writers by Carl Anderson. I plan to continue to peruse these books over break, and spend some time doing "big thinking" about writing workshop in my classroom for the rest of the year. 5) I haven't been writing or blogging regularly the last few months, and I realized recently that I miss it. It is still difficult for me to make time to write some days, but I share with my students on a regular basis how important it is for them to practice the crafts of reading and writing. Well, the same is true for me. I need to spend a little more time practicing my crafts. It will be easier to do over break; I hope I can make it a habit that continues after I go back to school in January. That's all for now. Good night, and have a wonderful weekend! I experienced "Great Joy" today, and I'd like to share it here. Today, our 5th grade students participated in multi-layered service projects. I live, and teach, in a community where most people have the luxury of counting their blessings on a daily basis for having a home to live in, food to eat, and nice clothes to wear. This week, and especially today, we spent some time thinking about those less fortunate than we are: the homeless, the infirmed, the impoverished, and the elderly. More importantly, our students took action in an effort to make the above-listed lives better. For the homeless, we had two actions. The first, was to assemble brown paper bag dinners for 100 people. The students made bologna and cheese sandwiches, packaged cookies and potato chips into Baggies, and put in soda pops and mints to make each meal. The second thing they did was to gather hotel/travel toiletries, and make toiletry bags for the homeless. They assembled over 100 toiletry bags. To pay for the food needed for our dinners, each child did chores around the house to earn money, and then brought those earnings in as a donation for our service project. We also had many children donate travel size toiletries that they either purchased or had gotten at a hotel -- we had over 7 boxes of different toiletry items. For the elderly and infirmed, we practiced some songs we would sing at the nursing home/ rehabilitation center close to us, and we made holiday cards to bring some cheer into these people's lives. After school, some of the children voluntarily met at this nursing home, sang carols, and handed out homemade greeting cards. Finally, we bought a cow and one other animal. Yes, you heard me correctly. The teacher I work with that organizes these service projects (thanks, Maria!) had heard of a way to help impoverished people through a donation called Project Heifer. Through a set amount of monetary donations, you can help by purchasing an animal for people that allows them to become more self-sufficient. Remember the chores I said our students did to earn money? Well, the money left over after paying for the food, in addition to some other generous donations from families, will allow us to buy a heifer and a goat, sheep, or hog (students were voting between these three). How amazing is that??!! So, back to "Great Joy" -- as I watched the students rotate through all 4 classrooms today, focused on helping others, and not on their own personal needs, I felt great joy. Which brings me to my final point. When the students came to my room, they were going to make the holiday cards for the elderly, but I also wanted a book with a great message to read aloud to all 95 fifth graders that I would be with today. I was searching through my books, looking for just the right one to express the feeling of caring about others, when my partner in crime here at Literate Lives, Bill, walked into my room. I told him my dilemma, and he immediately said I should take a look at Great Joy by Kate DiCamillo. I am so grateful to him for this suggestion -- this book was absolutely lovely. The pictures in the book are breathtaking and lovely, and the plot - a little girl worried about the organ grinder and his monkey that don't have a home - makes this book a must read! I actually saw fifth graders today, boys and girls alike, well up with tears at one point in the story. And at the end, they truly understood the meaning of "Great Joy". 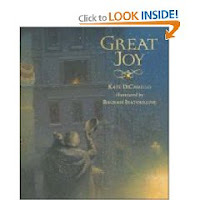 Great Joy is a powerful book, and one that I will immediately be adding to my classroom library. It was the perfect book to read today. Bill and I were fortunate recently to have James Preller (author of Jigsaw Jones, Six Innings, Along Came Spider) ask if he could interview the two of us together. We were excited about this opportunity for several reasons. First, I read and fell in love with one of his most recent books, Along Came Spider, this past summer. A friend of James came across my post, told James about it, he read the post, left a comment for me, and voila! -- we became connected through our respective blogs. Second, James is the author Bill has arranged to visit our school for two days in the spring. We are so looking forward to meeting him in person. And because he can stay for two days, we may have the opportunity for him to work with some of the upper grade students in a writing seminar / workshop setting. How wonderful that will be! 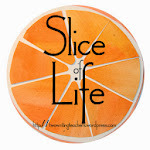 Finally, something James says in our interview rings so true -- the connectedness of the kidlit blogosphere is truly amazing! We have some basic core commonalities that join us all together as a community. The fact that this interview actually happened to us is a perfect example of this. So, if you'd like to see what James asked, and what Bill and I had to say in repsonse, stop on by. From the time I started teaching, one of my number one goals has always been, make it fun! I've always believed that if I can get the kids to look forward to school and enjoy every day they are there, I could teach them anything. To that end, when I moved into the library I took a look at the teaching guidelines and immediately started designing games to teach the skills. One of the few things I remember a librarian trying to teach me, was the Dewey Decimal system, and I could never figure out why. Now, before all of my librarian friends take a collective GASP! let me explain. I could never figure out why it was important to know what numbers went with what subjects when I was just going to look inn the card catalog (remember those?) and then go to the number it told me. I was capable of counting and understand decimals so I was always able to find the shelf address I needed. That's how I've approached it in the library now that I'm teaching the Dewey Decimal. I don't really care that the kids don't know that animals are in the 500s, can you find the 500s? Can you find 599.72 or whatever? Well, to help them with this skill, I designed The Amazing Library Race patterned after my favorite show, The Amazing Race on CBS. I was cheering for Dalla s and his mom...anyway, here' how it works and some pix of the most recent version in the library. It's simple really, I wrote four sets of clues that make the kids use their skills of finding books on the shelf. Each set has 5 clues and a roadblock challenge. The teams designated by the color of their bandannas get their first clue and are off to find the next clue hidden in the book found by using the call number. At some point they will hit the roadblock challenge which could be anything from putting a set of cards in alphabetical order and having one of ou r secretaries check their work, to counting painted tiles on the wall. Each team has a different color stop watch and the times over the four legs of the race are combined for a winner. I give a prize to the fastest team in each fifth grade class, and a bigger prize to the overall winner in fifth grade. Yes the kids are loud as they look for clues, yes they run in the hall to complete the roadblock challenge, and yes, I think they have fun. OK, Karen tried to take the heat for losing our blog list, but I've discovered the real culprits, IT'S THOSE ZANY ELVES! Well, it's been so long since I've written a post about a book, I'm afraid I might have forgotten what to do. 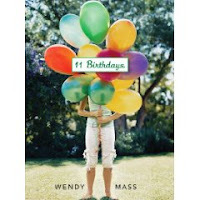 However, if I was going to end my work-induced sabbatical from reviewing, 11 Birthdays is the perfect "come-back" book! I got this book as an ARC way back in September. I jumped at the opportunity to read 11 Birthdays because it is written by an author (Wendy Mass) who wrote another book I truly enjoyed -- Jeremy Fink and the Meaning of Life. Right away, I noticed a connection between the two texts -- the main characters in both books are a boy and a girl. And better yet, they are a rare thing for children who are ages 10 and 11 --they are good friends. That is, Amanda and Leo have been inseparable friends for the past ten years. They were born in the same hospital on the same day, and ever since that time, they celebrate each of their birthdays together with some sort of themed party. Things went off-track when they were celebrating their tenth birthday together, and Amanda happened to overhear Leo telling a group of boys, who were questioning him about why he had his birthday party with a girl, that he only did it because he felt sorry for Amanda. Amanda was devastated by this news, and promptly left the party, never to talk to Leo at all during the next year. Fast forward to the day of their respective eleventh birthdays. They are each having their own separate birthday party for the first time ever -- Amanda is having a costume party, and Leo is having a hypnotist, famous football player, and a band at his party. Leo's is the party everyone at school is talking about. For Amanda (the narrator), the entire day goes badly. She has to take the bus to school, she forgets her lunch, her best friend, Stephanie, doesn't see her on the bus and sits with someone else, her locker door won't open, there is a pop quiz in her first class, she has to eat leftovers from other people's lunches at school, she tries out for the gymnastics team after school, but freezes and can't perform her back handspring, her mom is fired from her job, the Dorothy costume her mom rented for her birthday party is too tight and the red shoes pinch her feet and give her blisters, lots of kids just dropped presents off but didn't stay because they went to Leo's birthday instead, and even Stephanie, the best friend, abandons her to go to Leo's after a while. All in all, a dismal birthday, and Amanda can't wait to go to sleep and wake up to a brand new day. And this is where things get interesting in a "Groundhog Day" kind of way (though for me, these kids are much more enjoyable than Bill Murray). The next morning Amanda wakes up to find out it is the day of her 11th birthday again. Imagine having to relive a day as miserable as her "first" eleventh birthday was. Amanda is in disbelief at first, but after many attempts at trying to prove this is some elaborate practical joke her family is playing on her, she is finally resigned to re-doing the day all over again. She finally gets to the end of the day, and just dearly hopes that tomorrow will be a NEW day. Well, as I'm sure you can guess, that doesn't happen. Though I felt badly for Amanda, each 11th birthday replay becomes a little different and much more interesting, which makes it fun for the reader. The plot really starts to move along when we realize Amanda is not the only one reliving her birthday -- Leo is also. I don't want to give away much more, but the plotting to try to break the birthday replay cycle, the spells that got them into this mess in the first place, and the gradual rebuilding of a life-long friendship are great reasons to read 11 Birthdays. This was a delightful read for me. It's due out January 1, 2009 -- be sure to put it on your "To Be Read" list!! !